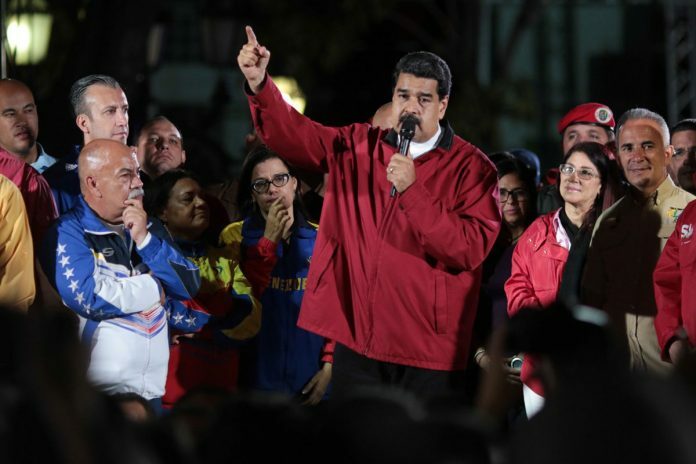 The Trump administration slapped financial sanctions on Venezuelan President Nicolas Maduro on Monday after a weekend election that gave the South American country’s ruling party virtually unlimited powers. The sanctions freeze any assets Maduro may have in U.S. jurisdictions and bar Americans from doing business with him. They were outlined in a brief notice by the Treasury Department’s Office of Foreign Assets Control ahead of a White House announcement from President Donald Trump’s national security adviser H.R. McMaster and Treasury Secretary Stevin Mnuchin. “Maduro is not just a bad leader, he is now a dictator,” McMaster said. The monetary impact of the sanctions wasn’t immediately clear as Maduro’s holdings in U.S. jurisdictions, if he has any, weren’t publicized. However, imposing sanctions on a head of state is rare and can be symbolically powerful, leading other countries to similarly shun such a leader. For example, the U.S. has had sanctions against Syria’s President Bashar Assad since 2011. Other heads of state currently subject to U.S. sanctions include Zimbabwe’s Robert Mugabe and North Korea’s Kim Jong Un. Monday’s move follows through on a U.S. threat of action last week against Maduro and his socialist government if they went ahead with Sunday’s election. Venezuela’s opposition calls it a power grab. “By sanctioning Maduro, the United States makes clear our opposition to the policies of his regime and our support for the people of Venezuela who seek to return their country to a full and prosperous democracy,” Mnuchin said. He warned of further U.S. penalties against Maduro allies. “Anyone who participates in this illegitimate (constituent assembly) could be exposed to future U.S. sanctions for their role in undermining democratic processes and institutions in Venezuela,” Mnuchin said. Officials had said the sanctions could target Venezuela’s oil sector, including possibly its state-owned petroleum company. But after the announcement, an official said Trump’s administration held off on sector sanctions due to possible complications, including some involving subsidiaries. The official wasn’t authorized to speak publicly on the process and demanded anonymity. The assembly will draw up a new constitution that many believe is aimed only at securing Maduro’s increasingly authoritarian rule. On Monday, Venezuela’s government said the election had given it a popular mandate to dramatically recast the political system, despite widespread claims of low voter turnout. The Trump administration was quick to denounce the vote. Venezuela’s socialist government on Monday claimed a popular mandate to recast the system. Now the U.S. Targets Venezuelan President Maduro for Sanctions.